The space I want to organize is very small. Can you still help me? We work with all sizes of spaces, whether it is small or large. Even small areas can become ultra-efficient when you apply good storage design. Fortunately for you, organizational design is our specialty. 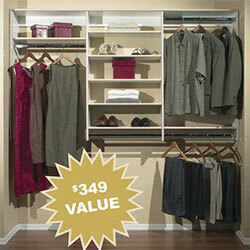 Our Classy Closets Green Line is LEED Residential certified. In the past, finding products made in an extremely environmentally friendly manner didn’t always equal beauty, but modern advances in technology have made possible the best of both worlds. Our Green Line combines responsible manufacturing and sourcing methods with sturdy and aesthetically pleasing finishes, veneers, and construction. When you choose our Green Line products, not only are you benefiting your own health but the health of our precious planet as well. Green Line products are also 100% ureaformaldehyde free. Yes, we do. We want you to be completely satisfied with the work we do. Contact us today to find out more about our lifetime warranty! Do you make appointments for Saturdays? Yes, we do. Please contact us to inquire about the availability of Saturday appointments. We know that our customers lead busy lives, which is why we make ourselves more available to you. Saturday appointments are just one more way that Classy Closets can serve you. Do you offer organization for counter-tops? Yes! Because counter-tops are often a crucial component to effective organizational planning, we do offer a variety of counter-tops for closets, offices, laundry rooms, pantries, and more. We are pleased to offer free in-home consultations. We invite you to get started by scheduling a consultation through our online contact form or by calling Classy Closets directly. At this appointment, one of our design experts will visit your home to gain an understanding of your organizational needs, take measurements, and discuss your style preferences. These personal consultations allow us to customize solutions to your specific needs. When you work with us, you are taking advantage of our years of experience in putting together effective organization systems.